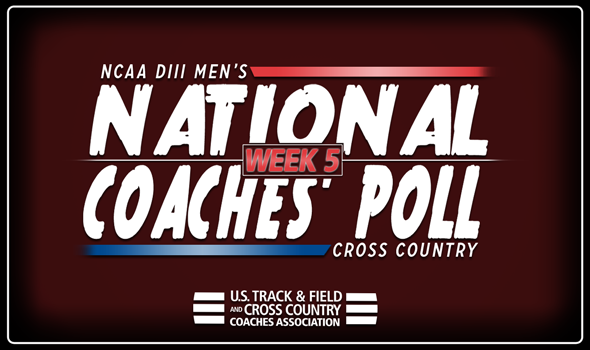 NEW ORLEANS – The NCAA Division III Men’s Cross Country National Coaches’ Poll is rested and ready for a huge weekend across the nation. There were no changes to the top-13 teams in the most recent edition, released Wednesday by the U.S. Track & Field and Cross Country Coaches Association (USTFCCCA). But there was a bit of movement in those teams slotted from No. 14 to No. 35. MIT and St. Olaf made the most of this past weekend as they both jumped two spots between Week 4 to Week 5. The Engineers went from No. 16 to No. 14 after a strong effort at the All-New England Championships at Franklin Park. MIT placed third out of every team in the meet, nearly topping NCAA Division I Northeastern. The Engineers put four runners in the top-35 with two finishing in the top-20 (Andrew Mah – ninth, Billy Woltz – 18th). The Oles went from No. 19 to No. 17 thanks to their effort at the Blugold Invitational two weeks ago. St. Olaf placed second out of 29 teams at the meet and put four runners in the top-20, led by William Anderson (10th) and Thomas Lerdall (11th). Here are the teams that moved up one spot from Week 4 to Week 5: Carleton went from No. 21 into a tie for No. 20, Otterbein moved from No. 25 to No. 24, Connecticut College went from No. 29 to No. 28, St. Thomas (Minn.) went from No. 30 to No. 29, Dickinson went from No. 31 to No. 30 and Rowan went from No. 33 to No. 32. Be sure to check back next week as there will be many more changes to the National Coaches’ Poll following a busy weekend highlighted by the Pre-National Invitational. Remember: The 2018 NCAA Division III Cross Country Championships will be held Saturday, November 17 at the Lake Breeze Golf Club in Winneconne, Wisconsin. Where Is The Nation Racing This Weekend? Here is a look at some of the notable meets this weekend with ranked teams.